One of the great things about the Final Girl Film Club is that we often get to revisit movies from the past that I would never think to watch again otherwise. 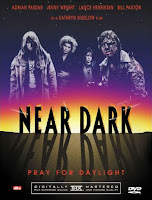 When discussing bloodsuckers of the eighties, films like The Lost Boys and Fright Night are immediately referenced of course, but if you dig a little deeper, Near Dark will invariably be mentioned. I suspect it is on a good number of film geek’s top vampire movies lists. Much like while watching Scarecrows last month, I was surprised by how much of Near Dark I’d forgotten. I didn’t remember Tim Thomerson was even in it. Christ, it’s been ages since I’ve seen that guy! 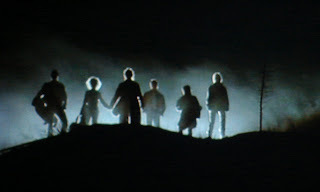 Near Dark is just a well done film with all the pieces fitting together nicely. It was the result of a collaboration between Kathryn Bigelow, who has had a fine career directing movies like Point Break and Strange Days, and genre veteran Eric Red. Near Dark has a story that doesn’t get bogged down with the how’s and why’s of undead lore. It just presents the here and now of the existence of a nomadic band of vampires. It is, for the most part, not sensationalized. There is no flying, no fangs and the V word is never uttered. This lack of supernaturalism is what I think makes Near Dark stand out. The ensemble cast is rife with familiar faces. Some of them stayed around like Lance Henriksen, Bill Paxton and Adrian Pasdar (Nathan Petrelli on TV’s Heroes) and some faded away into obscurity like Joshua Miller and Jenny Wright. An Aliens reunion of sorts. Before Carrie Anne Moss... there was Jenny Wright. Quintessential 80's babe! Near Dark is a little dated though. There is no question what decade this was made in. 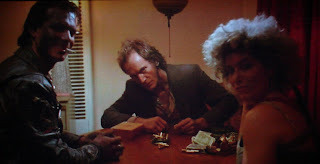 Even the score, provided by Tangerine Dream and heavily channelling Carpenter, further supplants the movie in the eighties. That is not a knock, just an observation. This doesn't extend to the F/X work by Gordon J. Smith however, because that still holds up well. Near Dark is a solid movie. It might be a little dusty, but there is no disputing its relevance. I can't believe that I hadn't noticed that the word "vampire" is never used inthe film. Lots of reviewers (myself included) have compared Near Dark to classic westerns, so I guess it kinda makes sense that they avoid using it.